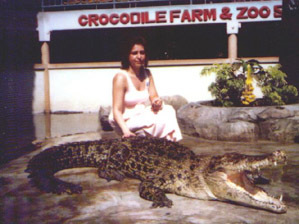 Welcome to my website " Absurd Universe in Me "
One of the most interesting places close to Bangkok is the Crocodile Farm and Zoo. but if you visit their water houses and offer them meat or fish, you will see their real characters. The struggle for life is so intense that they can even start eating each other. On the contrary, living close to crocodiles elephants are extremely caring and peaceful. Their show includes going through the row of laying people, trying not to step on them 😉 . But just in case I decided not to participate in the show and preferred to take the pictures.